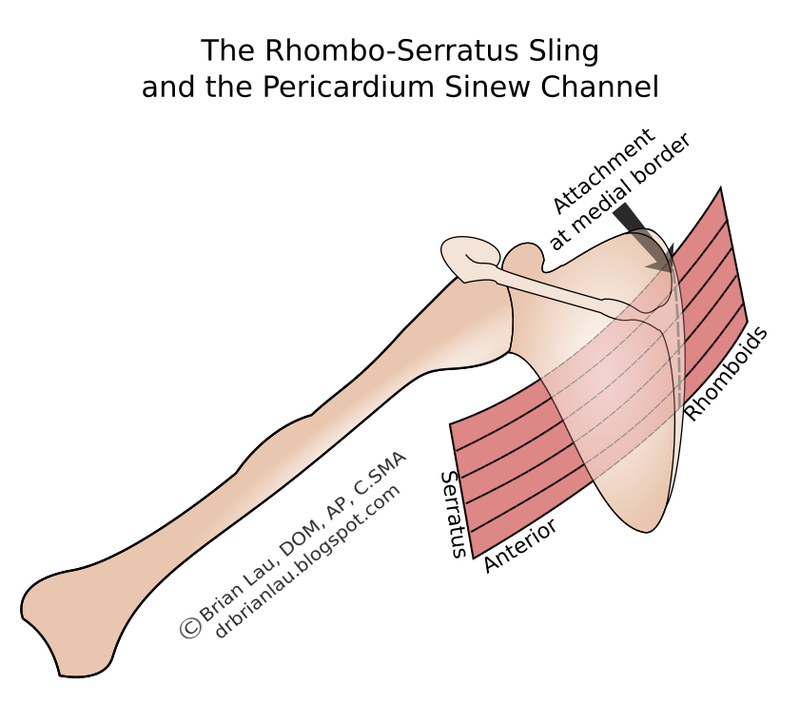 The rhombo-serratus muscle sling is a fascially bound structure consisting of the serratus anterior and the rhomboid major.1 The serratus anterior travels anterior to the scapula to attach to the medial border of the scapula, just next to the attachment of the rhomboids. Fascial fibers are shared between these two structures and their continuity can be observed in dissection (Fig. 1). Functionally, this sling works synergistically both to move the scapula into upward rotation (primarily controlled by the serratus anterior) while also stabilizing against the lateral pull (primarily controlled by the rhomboids).4 In other words, the serratus anterior is the prime mover for upward rotation, while the rhomboids fire to a lesser degree to resist the lateral pull on the scapula produced by the serratus anterior. 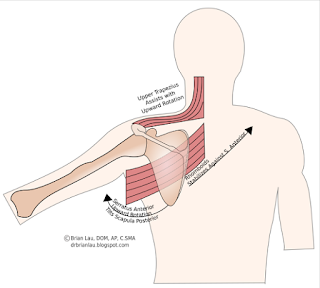 This entire action takes place with abduction of the humerus at the shoulder joint and is an important movement as it prevents impingment of the rotator cuff, subacromial bursa, and biceps tendon. With abduction past 30o, there is 1o of upward rotation or the scapula for every 2o of abduction or flexion of the humerus. This 2:1 ration is known as scapulohumeral rhythm, and it keeps the subacromial space open, as can be seen in the animation below. The serratus anterior often becomes inhibited and fails to take the scapula into upward rotation, therefore contributing to impingement. 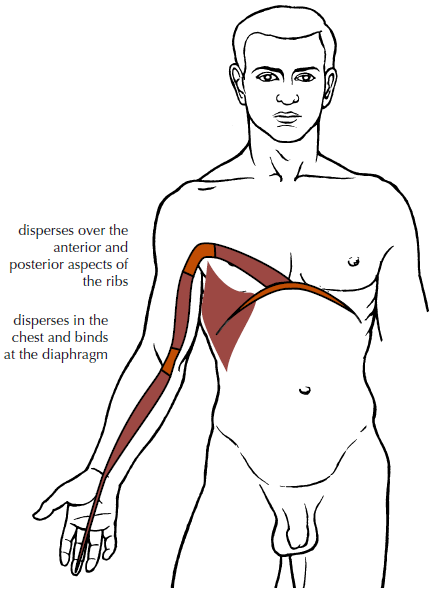 The upper trapezius also assists with this movement and it can be part of the problem, too. The upper trapezius is a muscle where the Sanjiao and Gallbladder sinew channels converge. So, the rhombo-serratus sling and the upper trapezius coordinate to produce upward rotation of the scapula. When these structures do not fire properly, they fail to bring the scapula into upward rotation with either humeral abduction or flexion. Although the rhombo-serratus sling is best attributed to the Pericardium sinew channel, SJ-5/GB-41 is a useful point combination to use distally to assist when there is inhibited action of these muscles. These points can be used with one of the motor points of the serratus anterior (SP-21 and GB-22, 23 are often reactive motor points) along with the motor point of the upper trapezius which is often needled by threading from SJ-15-GB-21.5 Proper training is required for all of these techniques so that the needle does not advance into the pleural space. 1. Myers, Thomas W. Anatomy Trains: Myofascial Meridians for Manual and Movement Therapists. 3rd ed. Edinburgh: Churchill Livingstone, 2014. Print. 2. Legge, David, and Karen Vance. Jingjin: Acupuncture Treatment of the Muscular System Using the Meridian Sinews. Sydney: Sydney College, 2010. Print. 3. Deadman, Peter, Mazin Al-Khafaji, and Kevin Baker. A Manual of Acupuncture. Hove, East Sussex, England: Journal of Chinese Medicine Publications, 2007. Print. 4. Phadke, V, PR Camargo, and PM Ludewig. “Scapular and Rotator Cuff Muscle Activity during Arm Elevation: A Review of Normal Function and Alterations with Shoulder Impingement.” Revista brasileira de fisioterapia (Sao Carlos (Sao Paulo, Brazil)) 13.1 (2009): 1–9. PMC. Web. 21 Mar. 2016. 5. Callison, M. (2007). Wrist and fingers. In Motor point index: An acupuncturist's guide to locating and treating motor points (p. 90). San Diego, CA: AcuSport Seminar Series LLC.